Statskog SF is a state-owned enterprise with a history back to 1860. 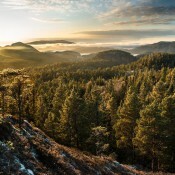 Principal activities are foresty and land-use management on behalf of the Norwegian Goverment. Statskog SF is the landowner of about 20 percent of the Norwegian mainland surface. Statskogs activities are in four core areas: property, energy, forestry and outdoor life.